I am a lot of things: wife, mom, sister, daughter, friend, stubborn, tender, dreamer, fierce, entrepreneur. I embrace all the things that make me, but at the bottom of it all, I'm just a girl. And I love the power and strength that comes with femininity. So this week, I'm going all girly on you, talking about beauty products. Day 2 is hair oil. I know. It sounds weird and gross if you're not familiar with it. We wash our hair to get rid of the oil, and then apply oil back in. Whatever. This is a good kind of oil! Moroccan oil is thick, not really "oily". There are tons of ways to use it, so you just want to get some and play around until you find what you love. For me: My hair is very long, nearly to my waist. And has long layers, with just a slight bit of wave. Not enough wave to be pretty, just enough to not be straight. So I discovered that Moroccan oil fixes it to be pretty again! After a shower, I towel dry my hair a bit. I brush it to get tangles out. While it's still quite wet, I put about a quarter sized amount of oil in my palm, rub my hands together, flip my head over, and scrunch it through my hair. Then I hit it with a few spritzes of a curling gel, scrunching it a little more. Then I go back a few minutes later with another quarter sized doze of Moroccan oil, scrunching. No blow dryer. On occasion I'll place 5 or 6 curls around my head with a curling iron, just to add extra body, but I don't do that every time. The result is soft, pretty, beachy waves. The oil soaks right in, like a lotion does on your skin. It doesn't stay "oily". But it accentuates the waves, adds loads of shine, and separates the hair into piecy bits. Total time "doing" my hair is about 4 minutes. This brand is Organix, and I just get it at Walmart or Target. 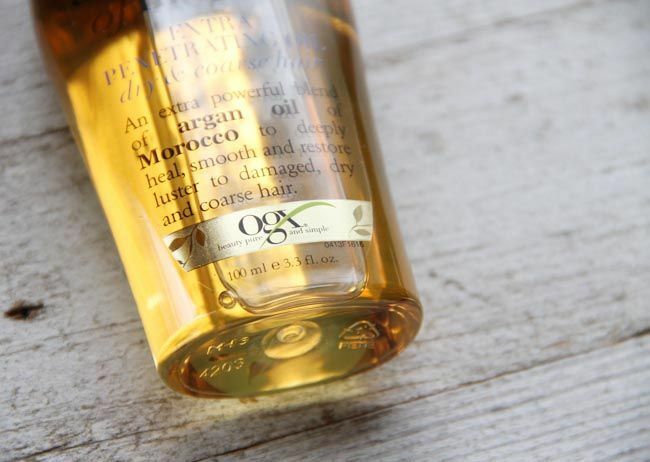 Do you use oil on your hair? Yes! I alternate between Organix Moroccan & coconut oils, depending on what I feel like that day. I even use their shampoo & conditioners. Love love love!! I just put straight up organic argan oil in my hair last night, then clipped it up for an hour or so before shampooing and conditioning as usual. Soft shiny hair today (which is a huge plus when it's on a 46-year-old head and is color-treated)! Love it. 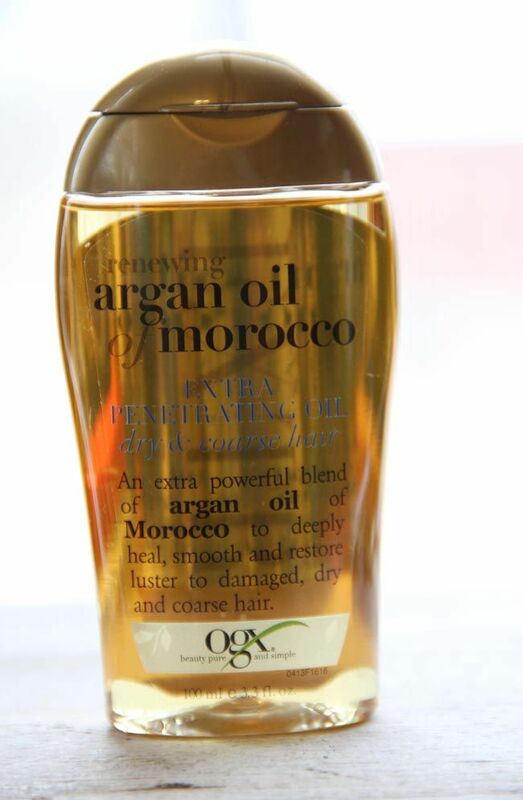 All my hair products have lots of argan oil in them. I love moroccan oil especially during winter! It makes my hair so soft! I have a fluffy style, so I use an olive oil shine spray. It is a light mist that calms the frizz and gives a beautiful glow. great stuff! I love that brand! But since I am from Wisconsin, I get staticy a lot. So when I lotion my hands I use the last little bit and run it through the ends of my hair to calm the fly aways and static cling.